As far as I know, 'The Tai Chi Space: How to Move in Tai Chi and Qi Gong' is the first book ever written by any of the senior students of Bruce Frantzis. If you attend my Qi Gong classes in Basingstoke on Wednesdays, my Saturday afternoon Qi Gong Workshops in Bramley or my Qi Gong classes in Reading on Tuesdays, you'll find this book extremely useful, as I regularly go to Qi Gong and Tai Chi training with Paul Cavel in London, whenever he's in the UK, and I do my best to reflect what and how he teaches. 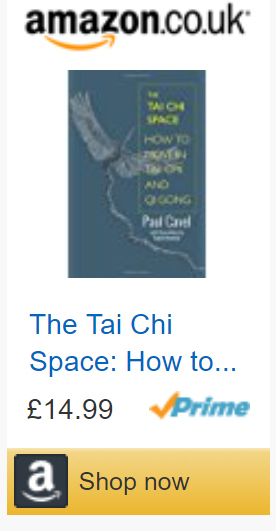 Paul has broken down the book into easily digestible and trainable sections, defining 42 essential principles of Tai Chi and Qi Gong. The first 16 principles, he makes relevant to whatever Tai Chi or Qi Gong form you practise, whilst the remainder of the book focuses on principles specifically trained in the first section of the Yang Tai Chi form up to Waving Hands Like Clouds, as taught by Yang Chen Fu, but still relevant in any of the Chinese internal arts. A simple piece of advice: If you train, read this book!